Remember to send me a pm if you know the answer. I'll post the answers the following day - and no Googling please! Who was only 12 years old when she sang in the Royal Variety Show in 1976? PM's ONLY!! Good on you ashman. I'm glad someone has responded to my plea for a time passing quiz. By the way, dunc tells me he has an idea for a European Championship game from 10th June to 10th July to keep us going for a month. That sounds good as well. PS "PM's ONLY" Do we have to send you a PM to prove we read it even if we have no idea? It's up to you. It just gives me an idea how many are interested though! Just have a go! Who was only 12 years old when she sang in the Royal Variety Show in 1976? I know you don't usually want clues but I have to post this and say that there is a clue in the image for anyone who doesn't know the answer. I give clues for anyone who gets it wrong or is struggling. e.g. I gave the clue LZ to question one to anyone who was stuck. My domain please. Keep the daily quiz going ashman, please. We can have the Euros Prediction Game as well. Answer to Question 2: In the song 'Waltzing Matilda' what is a matilda? A matilda is a Swagman's bundle or backpack. I was occupied with you and tonyp having a bit of a spat that I forgot to answer ....... I'd have got it wrong anyway as I thought it was his dancing partner. poshnipper wrote: I forgot to answer ....... I'd have got it wrong anyway as I thought it was his dancing partner. I think that is a brilliant answer! Wrong but very clever! I thought it was a sheep. 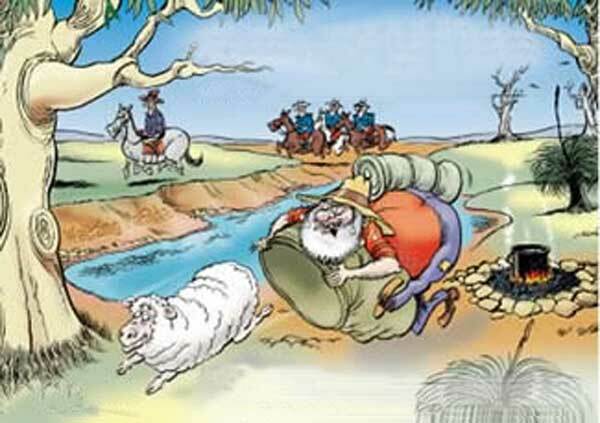 The title of the song is derived from an Australian phrase "waltzing the matilda" which is no longer in use today. It is believed to have originated from German immigrants who started settling in Australia from 1838. Waltzing is from the German term 'auf der walz' which meant to travel while learning a trade. Young German apprentices in those days travelled from place to place working under a master craftsman earning a living as they went and sleeping wherever they could. The German word 'walz' became 'waltz' in Australia. The waltz was a fashionable dance at the time and Australians were familiar with it. Matilda has German origins too and means Mighty Battle Maiden. It is believed to have been given to females who accompanied soldiers during the Thirty Year Wars in Europe. This came to mean "to be kept warm at night" and later to mean the great army coats or blankets that soldiers wrapped themselves with. These were rolled into a swag and carried behind their shoulders while marching. No you didn't and stop spamming!